Big Bubba may not be a real dentist but he sure knows his dentures. 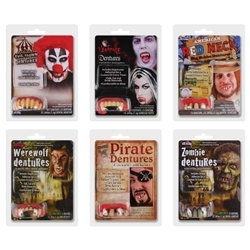 The big bubba dentures are available in five different styles. The Big Bubba dentures are made of soft rubber for a comfortable, one size fits most fit. Available in vampire, ghoul, cousin Clem, rotted vampire, or bubba.